BOO! 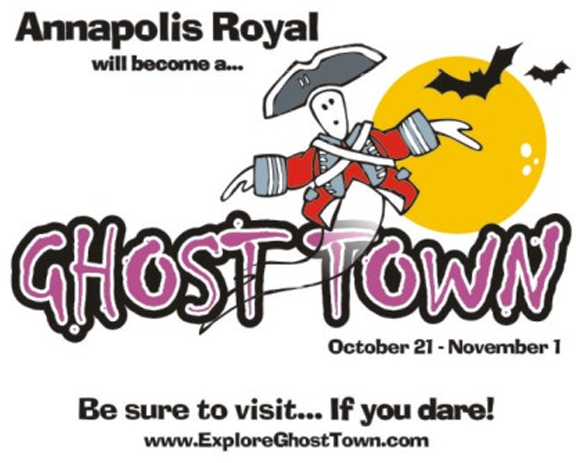 Numerous spook-tacular events will be held throughout Annapolis Royal, Nova Scotia during GHOST TOWN, Oct. 21 – Nov. 1, 2011. Enjoy a Haunted House at the Sinclair Inn Museum, A Skeleton Revealed at Fort Anne National Historic Site, Candlelight Graveyard Tours, Ghostly Gardens After Dark and Goblets & Goblins at the hauntingly boo-tiful Historic Gardens. There will also be some great Halloween parties, a Haunted Seek & Find, Ghostly Geo-Caches, and some ghoulish sales and specials by Annapolis Royal’s businesses. GHOST TOWN will conclude on Tuesday, November 1, 7:30 p.m. at St. Luke’s Church Hall with The Historical Association of Annapolis Royal’s Fall Meeting. Parks Canada Interpretation Specialist, Wayne Kerr, will give a spirited presentation about his latest book on the Garrison Graveyard, entitled History Etched in Stone: Gravestone Art and the Garrison Graveyard at Annapolis Royal. With the oldest stone dating back to 1720, (29 years before Halifax became the capital of Nova Scotia), the Garrison Graveyard is one of the oldest English graveyards in Canada. Hope you’ll plan to come sit for a spell, enjoy a bite and invite a friend to share this fun-filled evening with you. Best witches for a safe and Happy Hallowe’en! This entry was posted in Explore Annapolis Royal, Heritage, Theatre and tagged Alan Melanson, Annapolis Heritage Society, Annapolis Royal, Annapolis Royal Nova Scotia, Candlelight Graveyard Tours, Fort Anne, Historic Gardens, Historical Association of Annapolis Royal, King's Theatre, O'Dell House Museum, Sinclair Inn, What to see and Do, What's Happening. Bookmark the permalink.